Wandering Knits: Whoa! What did I do? "http://www.w3.org/TR/xhtml1/DTD/xhtml1-strict.dtd"> Wandering Knits: Whoa! What did I do? Look at that baby on the left. 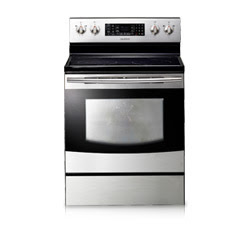 It's a new Samsung convection oven/stove. It will be in my house on Monday evening. I've been living for about a month with a stove that has only one small working burner. I thought I'd go to the store and get a new stove for $400. Arcing heat elements have a funny smell, by the way. Ozone, I guess. Mr. TellBlast and I have since shopped off and on for stoves, while I limit the cooking to meals that require one burner, or use the crock pot, oven, or combine cooking with the stovetop and microwave oven for our dinners. Guess what? There are no stoves for $400! During all this, I won a work promotion -- I write for examiner.com (free field trips at Drake University and getting free books at BookMooch are recent articles). Problem -- the $200 gift card that I won has to be spent within two weeks. So we're down to the wire today. I'm feeling a lot of pressure to buy a new stove quick. Lucky for me, Mr. TellBlast's three day work trip was cancelled, and businesses are still open despite the sub-zero temps -- we can go shopping together before two weeks is over. Yay! Chad at Lowe's gave us a significant discount. Free removal, delivery, and connection. And, no exposed heating elements for me to burn myself with bi-weekly regularity. This was the only model we found with stainless steel knobs. Did I mention that we visited five stores in one and half hours in bone-chilling cold in a rear-wheel drive, full-size van before we settled on the Samsung? Current concerns: Am I now a stove snob? Wouldn't snobbery be bad? Will I adjust to the convection? Did the residents before us leave icky stuff behind the stove? ohhh that's nice, real nice. anything is nicer than one burner. no stir fries makes some of us cranky. Not a stove snob, but everyone will be jealous!